and that is my very FIRST GIVEAWAY! 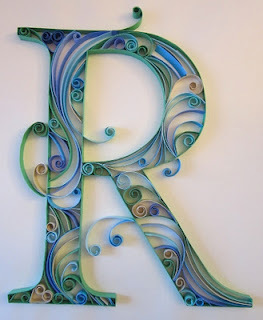 I am giving away a FREE 8 x 10 Custom Quilled Monogram. Colours and letter of your choice to be built by me, once the winner is announced March 24. I have been building so many of these Quilled Monograms for clients on my Etsy Shop and I really like making them so I thought I would make one for a giveaway. 1. Become a follower of my blog, if you are not already. What letter would you pick for a monogram and why does it have meaning for you? Entries will be accepted until March 23rd, 2012. I will randomly select a winner from the comment posts on March 24. I look forward to hearing your stories about your monograms! No longer accepting entries this giveaway is closed! International entries accepted! All are welcome! I would either choose the letter B, in purples, for our first born baby girl, Bianca, or I would pick the letter K, in blues, to give as a gift to my mother-in-law who lost her son, Kent. I follow your blog on 'Bloglovin'. I would love a monogram with the letter 'P' for my cat Pixie that died in 2010. If I win, I'd very much like it to be in orange-y colours. Big fan of your quilling - I've tried enough myself to understand how much patience is required! Ooooh! My son's name is Dante but we call him "Big D" so I'd pick the letter D! I am already a blog follower...and actually just ordered a letter G from you as my new last name is Gregg.... so what other letter would I pick? I would probably go with a J for my sweet little nephew Jesh's room. I am a follower. My letter would be D as it's the beginning of our surname and I call my hubby D and I'm Mrs D. My son would love it in his room! susand1408 at googlemail dot com. I'd pick the letter C for two reasons. It's the first letter of my son's name (we've only got one child, not playing favourites!!) and it is also the first letter of our surname so it would be great on both fronts. Would love to win one of these as they look beautiful! I'm now a follower- just found you today and am hooked! I've been quilling off and on for 9 years but have never thought of doing a monogram. I love it! I'd pick either "Y" for myself (my last name) or a "S" for my mom. She is getting married next month and it would be a fun to give her something with her new last name. I am a follower with gfc! I would choose the letter T, because I am getting married to my best friend in just 2 months, and my new last name will be Tucker. I think it'd be a great marriage and house warming gift! I'm a follower- I would pick H because my first and last name both start with it, and my mom's maiden name started with H as well. I would get "R" as my letter. Our last name starts with R and it's also starts my husband's name. I can imagine it up in our house in our living room. So creative and unique. Wait... ninja? Well... okay! so the moral of this tale? A! A is for Awesome. I love keeping up on all of your creative adventures on your blog Meesh! I would choose the letter R for my first name- thanks for the giveaway! I follow through GFC and I would get the letter R for my granddaughter, Riley. This would look so beautiful on her bedroom wall! I am a follower. I would probably pick the letter G for our last name. I would choose the Letter A since my last name is Ayer :) It would look gorgeous in my home! Thank you so much for the awesome giveaway!